Primped and polished gardens are all very well (we’ll be seeing a lot of them at Chelsea in a few days’ time) but for those of us who work and can’t afford help they can be a little intimidating. Small imperfections are natural and larger ones excusable. They render a garden approachable and understandable, revealing something about the way it works and the gardener that tends it. Flaws also lend a garden part of its atmosphere: glorious disarray is so much more evocative than clinical maintenance. The only gardens I never warm to belong to those stately homes, suburban villas and monotonous bungalows possessed of velvet-pile lawns, gappy planting and bushes so tightly pruned that they appear to have given up on life. Exemplifying glorious disarray, if not wild abandon, is a little known valley in South East Kent known as The American Garden. You won’t find it in any guide book, and without a decent map you may not locate it at all. However, during the month of May you’ll find The American Garden open each weekend from 2-5.30pm. I’d urge you to make the detour and immerse yourself in its dank, dark, yet exuberant depths. This part of The Garden of England has been mercilessly bisected by both the M20 and the HS1 train line on which Eurostar runs. Many years ago, as a Landscape Architect, the firm at which I worked acted for many of the landowners in this part of England who wished to keep their estates intact. Most, including Sandling Park, failed in their appeals. Both routes narrowly miss The American Garden, but the roar of traffic can still be heard. The American garden is so called because of the Californian redwood tree that was planted at its heart by William Acomb in 1854. Acomb was employed by Archdeacon Croft, who was rector of Saltwood from 1812 until his death in 1869. Educated at Eton and Cambridge (a winning formula then, as now), he married, appropriately, a daughter of the Archbishop of Canterbury. With his stipend of £4,850, which was one of the richest in England at the time, he purchased Saltwood Alders, an area of bog created behind ancient beaver dams. Croft proceeded to clear the land for charcoal manufacture, creating a garden in its wake. 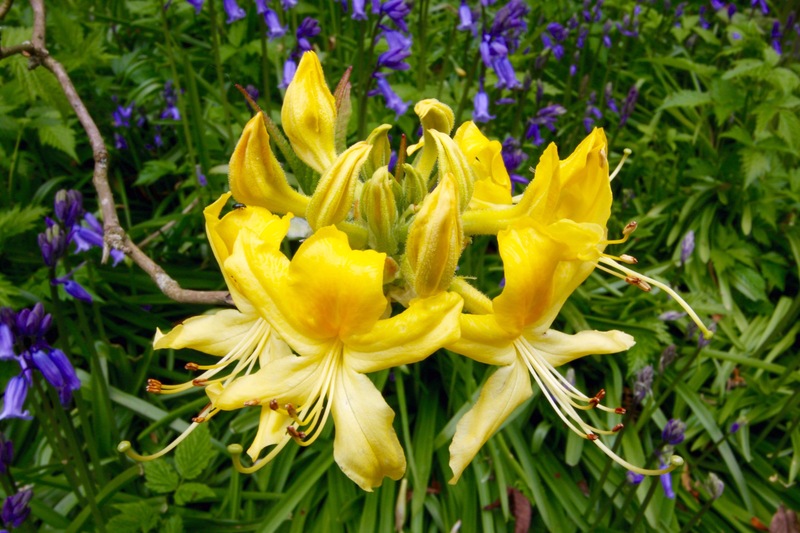 At that time new plant discoveries were arriving thick and fast from around The British Empire, including rhododendrons and azaleas from the Himalayas. 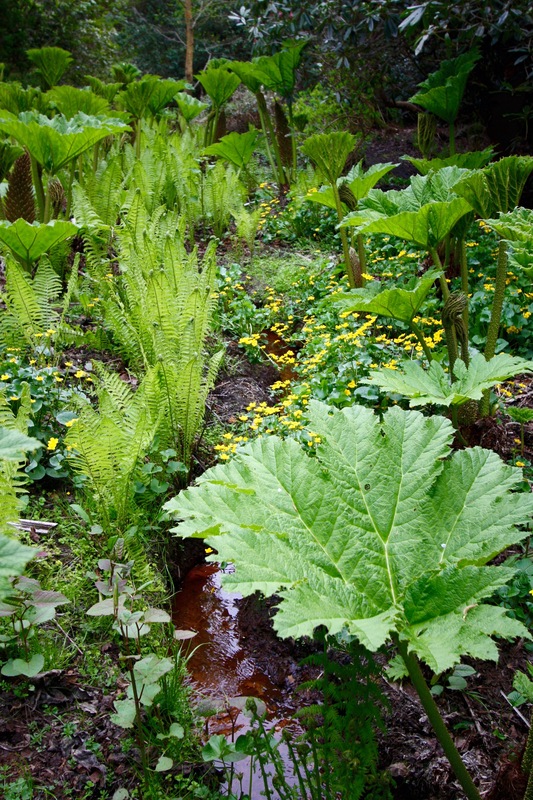 Conditions in Archdeacon Croft’s garden mimicked the humid mountain valley climate perfectly and new introductions such as Rhododendron ponticum and R. arboreum flourished in their new home. Having employed William Acomb as gardener, the Archdeacon went on a spending spree, purchasing plants from all corners of the Far East and North America. His successor, Canon Hodgson, continued to build the collection, followed by a gentleman called Alfred Leney, a brewery entrepreneur from Dover who improved the structure of the garden. 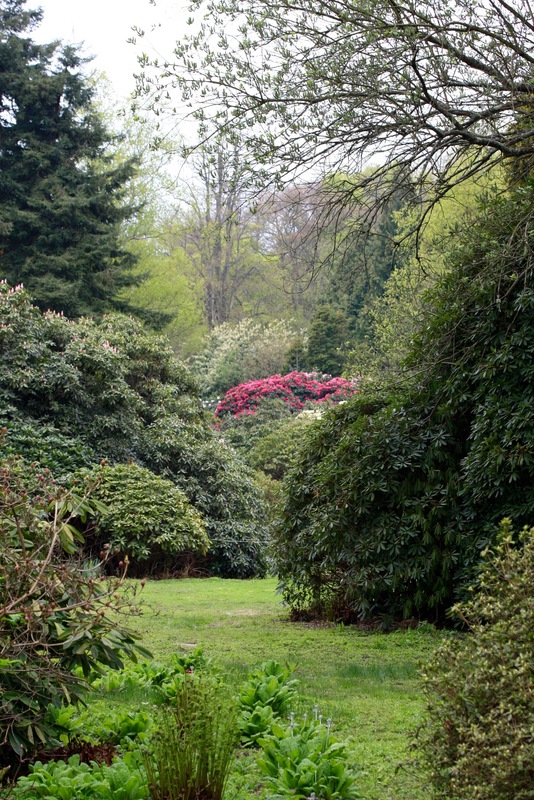 Between 1947 and 1976 Stanley Harland and his gardener Alex Pleuvry replaced large swathes of laurel with newer varieties of rhododendron, including the Kurume azaleas which still grace the Dell Walk. Stanley Harland died in 1998, passing the garden on to his son Nigel, who valiantly continues its upkeep. Managing a garden on this scale cannot be easy, especially on a budget. The maintenance regime appears to be one of managed decline, with the focus on clearance and access rather than new planting. 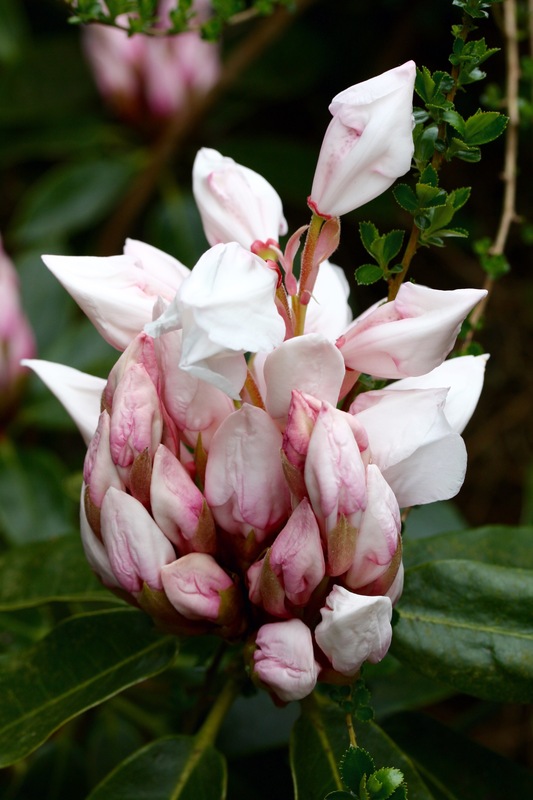 This is a pity as there must be many unmarked hybrids in the garden that are worthy of identification and propagation. On a previous visit a tree-sized Embothrium coccineum, the fabulous Chilean fire bush, grew in the centre of the garden’s largest glade. Sadly this has now fallen, leaving behind the clump of wisteria-covered azaleas that grew in its shade. I hope The American Garden does not go the way of other gardens from this era that have found themselves without sufficient funds; swamped by sycamores and brambles, waiting for rescue. East Kent could benefit from a garden of this kind if only it had the means to smarten up its act and resume the building of a strong plant collection. In the meantime the experience of a visit to The American Garden, parking in a neighbouring orchard and plunging into the gloaming of The Dell, is like entering Jurassic Park. Your senses alive, you’ll discover many things, but there won’t be a tightly clipped bush in sight. Discover more on The American Garden’s website. Yes, there’s a surprisingly fine line between “glorious disarray” and unloved wilderness. Like you though, I find gardens that are controlled to within a leaf of their lives are never very inspiring. Let’s keep our fingers crossed for this one. Indeed. At least I can sleep at night knowing that no garden of mine is ever likely to suffer from being over controlled! I don’t really care if the garden is well tended or not. There is much to learn from both the polished and the more natural gardens. I get inspiration from both and as a nature lover, from the best designer of them all, Mother Nature imparts the best lessons. I am sure I would love seeing all the gardens in the UK, even an American one. Isn’t it interesting how at one time industry and garden development went hand in hand? Seems rather more cold-hearted now to say the least. I hope it makes it. The great industrialists of Britain were responsible for so many fine gardens. They had the money and the need to show off, but seemingly rather more taste than the new breed of super rich. The only gardens I never warm to belong to those stately homes, suburban villas and monotonous bungalows possessed of velvet-pile lawns, gappy planting and bushes so tightly pruned that they appear to have given up on life. I thought that you were talking about the American gardens in this statement. Of course there are some lovely American gardens but there are many of the McMansions with the plastic, cookie cutter landscapes. This is also true in Canada. Unfortunately as a nation, we don’t seem to breed gardeners. Hopefully this lovely American Garden can manage to find a way. I really struggle with road noise in gardens. It has put me off a good number of houses we’ve thought of buying in the past which have had lovely gardens but have been close to the highway. If and when we find our ‘forever’ garden I want to hear nothing but birds singing. I know what you mean! In suburbia, if it’s not the traffic noises it’s the roar of the lawn services. Some years ago I made a year-long video of my then-garden (which I thought was in a quiet neighborhood) but was shocked at the amount of manmade background noise that came through on the finished product – yikes! Thank you for the photos, story and history of this unique American Garden. I was just thinking tonight, after returning from meditating by the rushing stream in a city park, that a lot can gleaned about values, priorities and resources of a community and an historical age based on what is locally kept up and what falls into decay. The advance of noise and concrete seems ever relentless . . . your description is a reminder to appreciate any opportunity to garden simply surrounded by the sounds of Mother Nature. That’s an interesting perspective Jan. I often wonder, especially in this history rich country, why some buildings and gardens find favour and are rescued, and others decline and disappear. I get that it might often be down to resource and values, but some features just seem to engender more passion than others. I suppose it’s the equivalent of natural selection. We can but hope we are left with the best of the best. Excellent point about passion! Certainly that varies from generation to generation. I find that in many cases passion, values, and resource allocation overlap and re-enforce each other. And, yes, let us hope that passion and effort conspire to save the best of the best! I only discovered The American Garden, in Saltood (Hythe) Kent, last year (2015). It is little known, receives no subsidy, isn’t RHS or anything like that – but is the MOST GLORIOUS RHODODENDRON and AZALEA spot I have ever seen, for myself. TOTALLY ‘UNSPOILED’ one hardly has time to draw breath, as one moves through this heavenly valley of unsurpassed floral beauty! It “beggars belief’ that around each corner as you walk through this garden, you discover yet another “breathtaking” display of glorious, colourful, mind blowing blooms ! The whole aura here “pervades your senses” – transcending anything worldly, leaving you suspended in nature and the “wonder” of it! I guess the true lovers of this garden experience “covet” their own discovery of it – to such an extent, that we don’t seek to publicise its’ existence, selfishly hoping it will retain its’ ‘magic’ and never “be discovered” by commercialism. Keep it a secret 😷 or allow word-of-mouth to suffice. I left The American Garden, feeling in a much better space than before. Praise indeed for a very unique garden Carol. We are so accustomed to manicured gardens opened to the public that The American Garden is strikingly refreshing. We try to visit every other year and are always blown away by the scale of the plants and profusion of flowers. All that’s required is a sturdy pair of shoes. I can’t imagine the garden would ever be mobbed, but if it were I am sure the entrance fees would help greatly towards the upkeep. We only discovered it yesterday and I heartily agree. 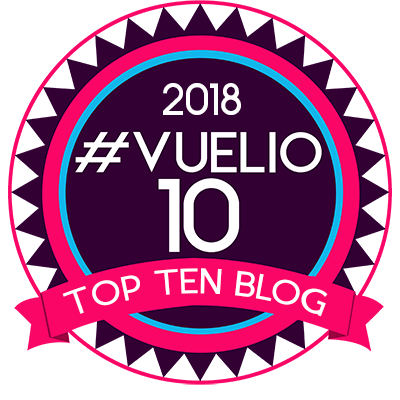 The whole experience (including the tea and cake from the Tennis pavilion!) was uplifting and good for the soul in these terrible times. One could not imagine anything too bad happening at The American Garden. Tripping over a tree root, or a twig in the eye perhaps. Glad you enjoyed your visit. Dan. 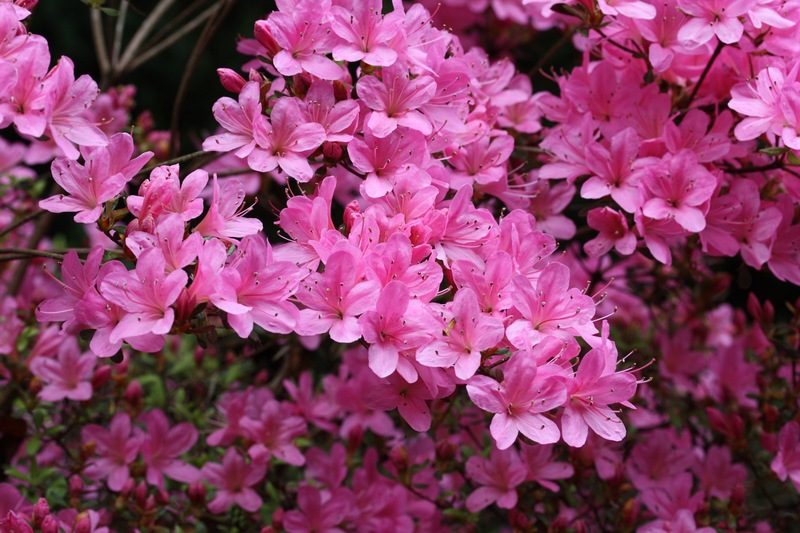 Do rhododendrons need much tending? They seem to spread like wildfire. I live close to the American Garden and have visited a couple of times but find them a bit too much after a while. I know a wild woods close by which has a profusion of rhododendrons which are gradually taking over and crowding out other species. Rhododendron ponticum, which is the rootstock onto which many choice species are grafted, is the problem. It has pinky-mauve flowers and, as you say, spreads like wildfire. In some National Parks it has become a serious problem. 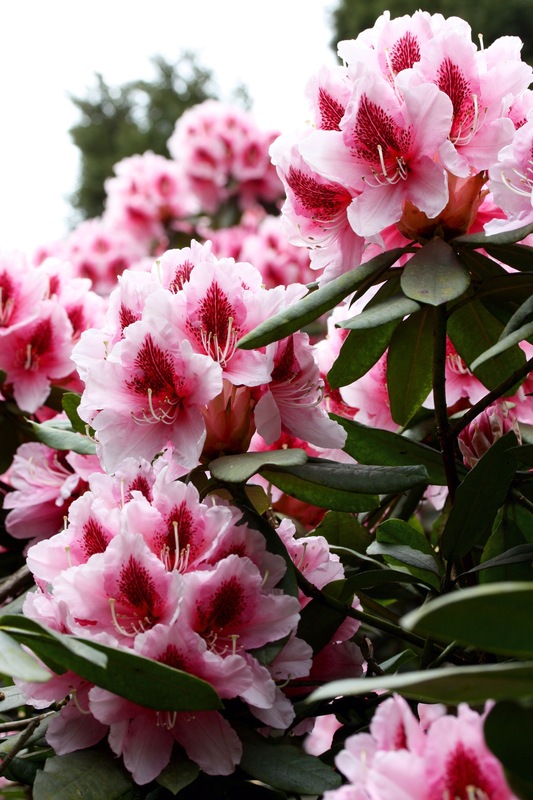 However, most garden rhododendrons are not remotely invasive and provided they are planted in acid soil will need very little care and attention. There is an enormous range of species and varieties to choose from, from small shrubs to tree-sized giants.